King’s Cross is one of the six Lumiere London areas, where light-based artworks are on display every evening until Sunday. 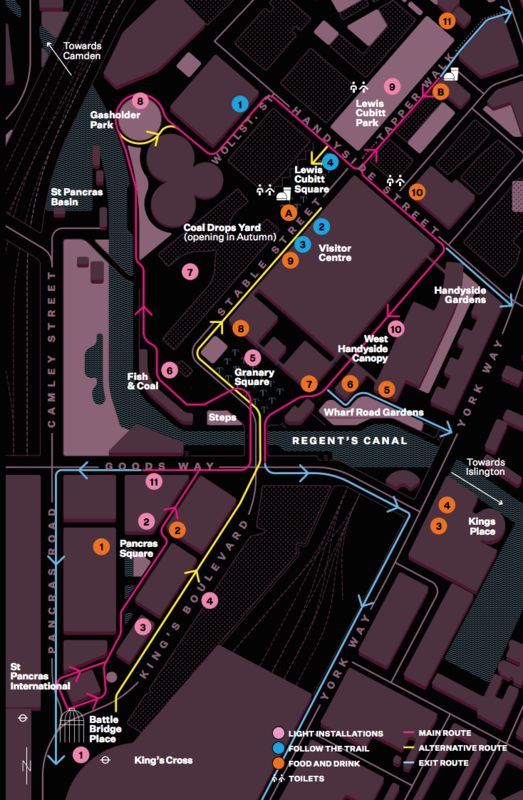 We looked at the general maps of the event yesterday, but we discovered also that King’s Cross has its own map, showing where the exhibits are. 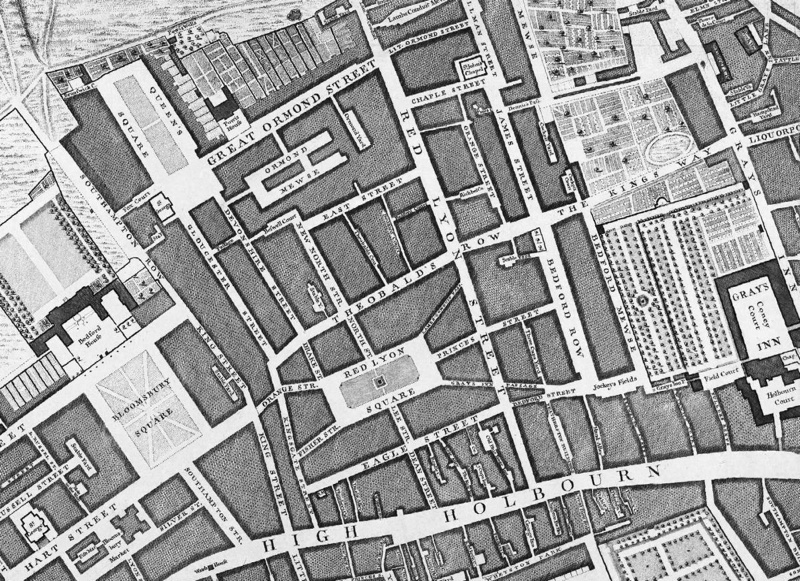 You don’t have to follow the marked route, although it does take you past all the key exhibits, and, with the expected large crowds, you may find it makes sense to follow this path of least resistance! 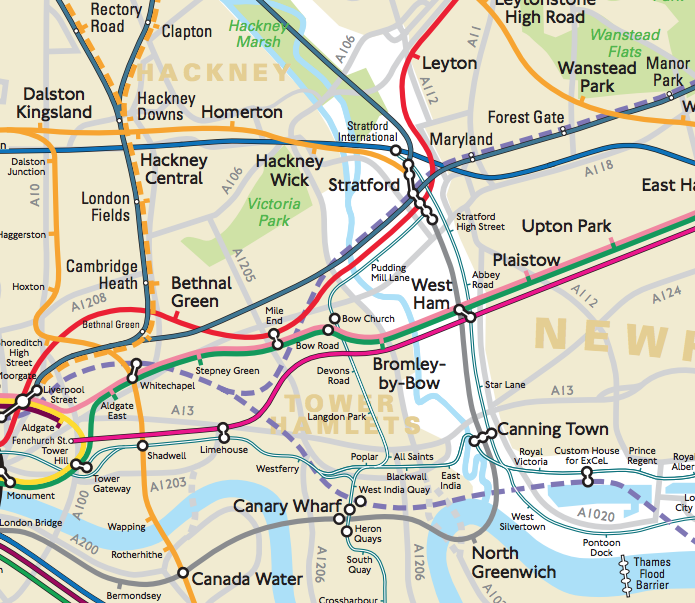 Mapping London likes this attractive, clear map that is using a nice “nighttime” black, pastel pink and maroon colour scheme, bright colours for the routes and attractions, and nice labelling for the new streets. The area is rapidly evolving with different areas constantly opening up to the public. Current construction zones are shown as areas of dots. The canal is shown with watery waves, and green areas are a lighter pink shade. The overall effect is rather nice. Paper copies of this map are being handed out at the entrances to the area each evening. People who get one, and visit four places marked on the map (including a colourfully lit night market), can get their map stamped at each, and then and get free candyfloss or a glow band. Waterlicht (No. 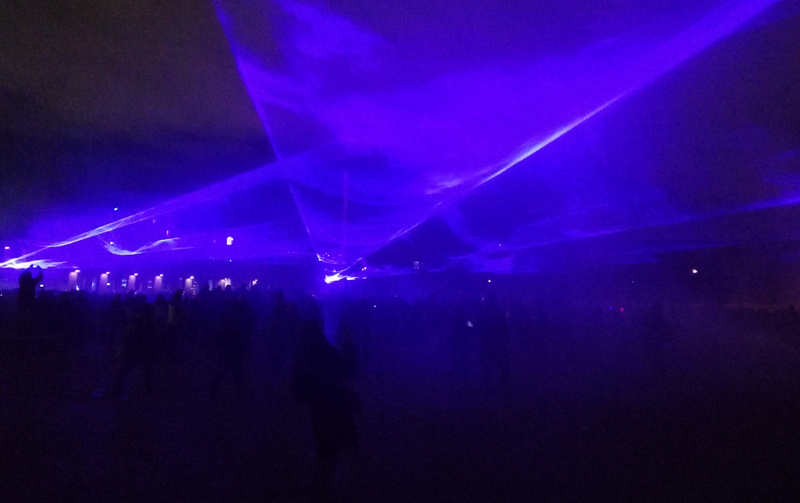 5 on the map) is the undoubted highlight – lasers and dry ice across the huge Granary Square. 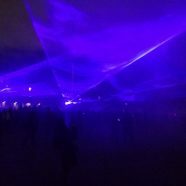 See pic below for the general effect, it is one to definitely experience for yourself, it fills the whole square and has the crowds underneath it in awe. It reminds me of the Weather Project at the Tate Modern back in 2003. If you are looking for No. 7, look up high! It’s a screen suspended from a crane, which is appropriate enough, as it’s showing animation about cranes. Lumiere London is happening again tonight, and on Saturday and Sunday, from 5:30pm to 10pm.